The combination of high quality memory foam as a top layer with a base layer of Reflex foam creates the best sleeping surface of all of our adjustable bed mattress range. The benefits will be optimized when used together with an electric profiling bed. 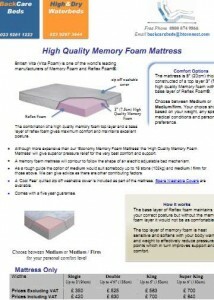 Our high quality memory foam mattress will give support and comfort that almost no other mattress can give. I say almost because there is only one mattress that offers support, pressure relief and comfort that surpasses that of an adjustable bed and memory foam mattress. Those of you with your heart set on purchasing an electric bed for health or medical benefit can relax. You are making the right decision. Those that want the very best mattress possible should do a little more research and maybe give us a call to discuss various options. We manufacture the adjustable bed mechanisms for many retailers throughout the country and pride ourselves on honest advice. We may lose credibility for suggesting an alternative with those of you not so open minded but here goes. A modern waterbed gives unequaled pressure relief and support. Comfort is the result of reduced pressure points and support during sleep. There, I’ve said it and if you are still reading you may think what does this guy know? I could bore you for hours but after twenty six years of working and studying in the specialist mattress industry I would like to think I am able to give the best advice. Now back to the subject of your new profiling electric bed. A waterbed is fantastic however a waterbed is not as practical as an adjustable bed in many circumstances. For example getting in and out of an adjustable electric bed is considerably easier than a waterbed. Acid reflux, heart conditions and breathing difficulties are examples of conditions relieved by raising the head end of the bed. Having decided that an adjustable bed is worth investing in to benefit your health, how do you choose which mattress to purchase in combination with the mechanism? Unlike other retailers we try to tell give honest advice, unfortunately the best mattress in nearly all instances is our most expensive, sorry. Recent poor advice given with the best intention was the promotion of orthopaedic mattresses. The name sounds good but these are just very hard. The principal is to keep your back and spine straight. The problem is that it is very uncomfortable and offers little or no support particularly in the small of the back. Our high quality memory foam mattress works in much the same way as a modern waterbed. The base layer of special purpose reflex foam provides the correct posture which is further enhanced by the profiling of the adjustable bed mechanism. It is important that the base layer allows some indentation from the main pressure areas which are shoulders, buttocks and hips. The amount that the reflex foam allows you to sink in is important. Too soft and you will not have enough support, too hard and you are only slightly improving on the orthopaedic mattress. As a general guide the medium is ideal for most people. The soft is generally for the very frail of below 6 stone (38kilos) and the medium / firm for those over 17 stone (108 kilos). This is just a guide as there are many contributing factors such as height, medical conditions and mobility. So if your decision is not clear cut you should give us a call and we will try to advise you. Having decided on the density or firmness of the base layer which is in effect the firmness of the mattress we come to the memory foam top layer. You have no decisions to make, just to know that it is this layer that gives the comfort and support. The memory foam is pressure and heat sensitive. Yes, it was developed by NASA but don’t be taken in by that. It was not developed for astronauts mattresses but for the inside of space suits. It just so happens that these properties lend themselves perfectly to the pressure relieving top layer of a mattress. Shoulders and hips sink in to the memory foam allowing pressure to be spread over a larger area giving maximum comfort whilst the base layer maintains posture and support. Simple, and it works. This entry was posted on Tuesday, October 18th, 2011 at 6:55 pm	and is filed under Adjustable Bed Mattresses. You can follow any responses to this entry through the RSS 2.0 feed. You can leave a response, or trackback from your own site.